Emirates' A380 to arrive Tuesday morning. 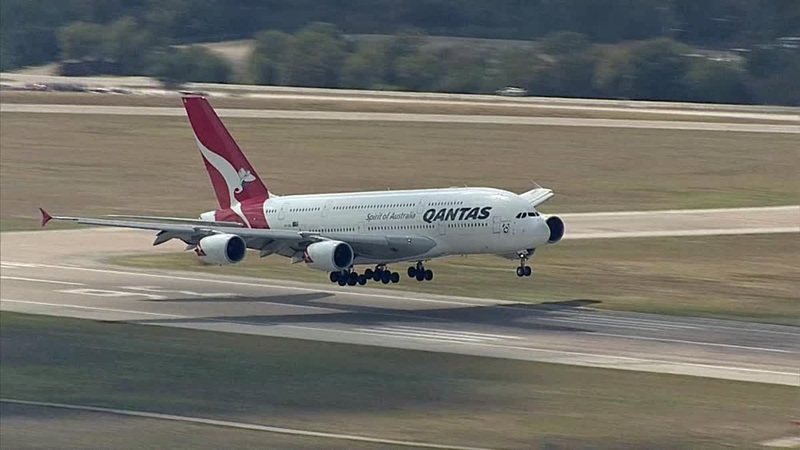 The 8,600-mile flight was the first of what will be six weekly, nonstop flights on Australia's Qantas Airways between Sydney's Kingsford Smith International Airport and DFW. The flights will depart and arrive every day but Tuesday and are expected to take just under 15 hours to DFW and 15 hours and 30 minutes to Australia. "It's very appropriate that the longest flight in commercial aviation, Sydney to Dallas-Fort Worth, now has the largest airplane flying it," said Sean Donohue, the CEO of DFW International Airport. In honor of the inaugural flight, the airline added a bit of flair to their kangaroo livery — including a cowboy hat and bandanna. Additionally, travelers were offered the option of a Texas-inspired menu including barbecue sliders, Dr Pepper, rib-eye steaks and chipotle pork tacos. After crossing the Pacific Ocean and Mexico, Qantas Flight 7 lumbered along on final approach before touching down about 25 minutes early Monday afternoon. After which, the travelers were greeted with a celebratory water cannon salute before coming to a stop at a specially-modified gate at Terminal D.
Actor John Travolta, who serves as the airline's ambassador, helped welcome the first flight to DFW. "That was the happiest group of passengers and crew I have ever seen get off a 15-hour flight," said Travolta. The Qantas A380 seats 484 passengers, including 14 First Class Suites, 64 Business Class seats, 35 Premium Economy seats and 371 Economy Class seats with room for four crew rest areas. On Wednesday, Emirates Airlines joins Qantas as the second airline flying the superjumbo passenger jet into DFW; Emirates flights will be direct to and from Dubai, United Arab Emirates. DFW Airport has been preparing for its newest arrival for years. A decade ago, Terminal D was designed with the European-built A380 in mind. “It always was the dream for this particular terminal to have A380 service,” said Perfecto Solis, vice president for airport development and engineering. The plane is so large that workers at DFW painted its outline on the tarmac to see exactly how much space it would need. They also used 3-D computer models to see how the A380 would fit in at DFW. 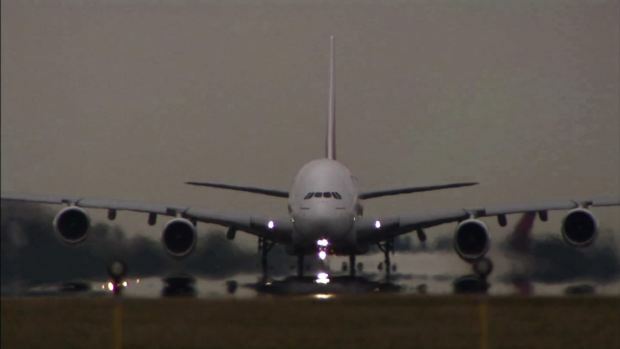 Starting next week, the Airbus A380 - the largest passenger jet in the world - will begin scheduled service at DFW. 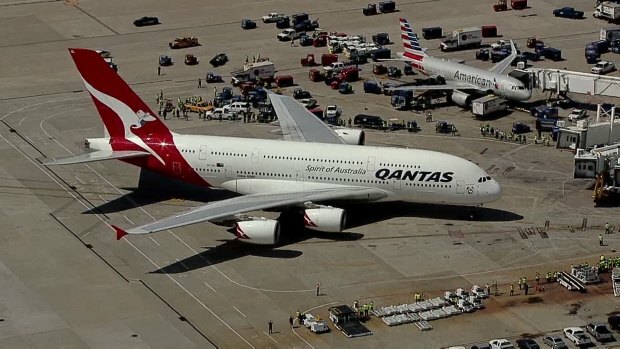 Australia's Qantas will fly the A380 between DFW and Sydney. Despite years of advance planning, DFW still had to make $4.5 million in tweaks to accommodate the A380. Taxiways have been widened, and hundreds of seats have been added inside the terminal for waiting passengers. But the most visible changes are at the gate. The A380 will occupy two gates at once — D15 and D16. Passengers will use three jet bridges, one of which rises more than 30 feet off the ground to reach the plane's upper deck. With the arrival of the A380, DFW joins the ranks of cities like London and New York, where the A380 is a regular sight. “I think it speaks directly to the fact that the international community sees DFW as an international powerhouse,” said Solis. Airline officials say the new addition will have a $200 million economic impact on North Texas. "This is a huge boost of confidence for Dallas-Fort Worth Airport and the community," said Qantas Senior Executive Vice President Vanessa Hudson. NBC 5's Johnny Archer contributed to this report.